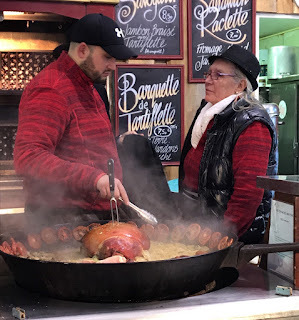 Steam rises from a giant iron skillet filled with boiling potatoes, onions and ham, the ingredients for tartiflette, a cold weather favorite anywhere in Paris, and a signature dish at the Marché de Noel in La Défense, one of the biggest Christmas markets in France. Walking along a blue carpet past little bungalows with roofs covered in white felt to look like snow, I wander the stalls, accepting samples of cognac laced with caramel, nougat studded with almonds and slivers of black ham from Corsica before settling on a cup of mulled wine and a “raclette sandwich” of cured ham and melted cheese piled into a baguette big enough for three. Winter is my favorite time of the year in Paris. Air fares drop, and planes tend to be half-full. Hotels offer tempting discounts, and it's possible to walk into museums and sites that other times of the year require waiting in line or buying tickets in advance. Darkness falls early, which means you’re more likely to be settling into a snug cafe with a book and a glass of wine rather than picnicking along the Seine. Adopt the local uniform - long coat, hat and big scarf- and you’ll be ready when a sidewalk table opens up under the red glow of an overhead heater. It’s not too late to enjoy this year’s holiday-season festivities, or plan for next year. The weeks before, during and right after Thanksgiving tend to be quiet, yet festive, a time when Europeans travel, but not many Americans. Most of the Christmas markets begin December 1, but a few, such as the one in La Defense, start in late November. 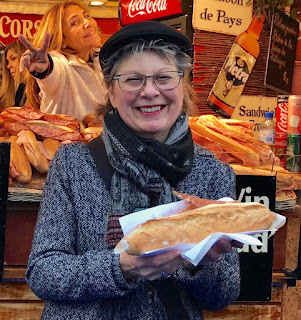 I just returned from a Thanksgiving week visit where I met up with a friend who is in Paris for a month. We took in first-class art exhibits (November was photography month in Paris); enjoyed meals far less expensive than in Seattle, L.A., New York and many other U.S. cities; planned a day trip by train to the city of Rouen to visit the new Joan of Arc museum; and of course, did some early holiday shopping, warming up along the way with mugs of vin chaud. *Shop for air fares anytime to get a feel for prices, but don’t buy too early. I bought a ticket about three weeks in advance for $650 on a non-stop Delta/Air France flight between Seattle and Paris. *Check hotel specials on sites such as booking.com or agoda.com. The lowest prices will be for advance payment, non-refundable reservations - something I avoid when planning a trip that's months away, but am willing to risk when booking last-minute. I used Agoda to find a $104 non-refundable rate for a three star hotel in the Marais district when the hotel itself was quoting $130, still low compared to $200 or more in high season. 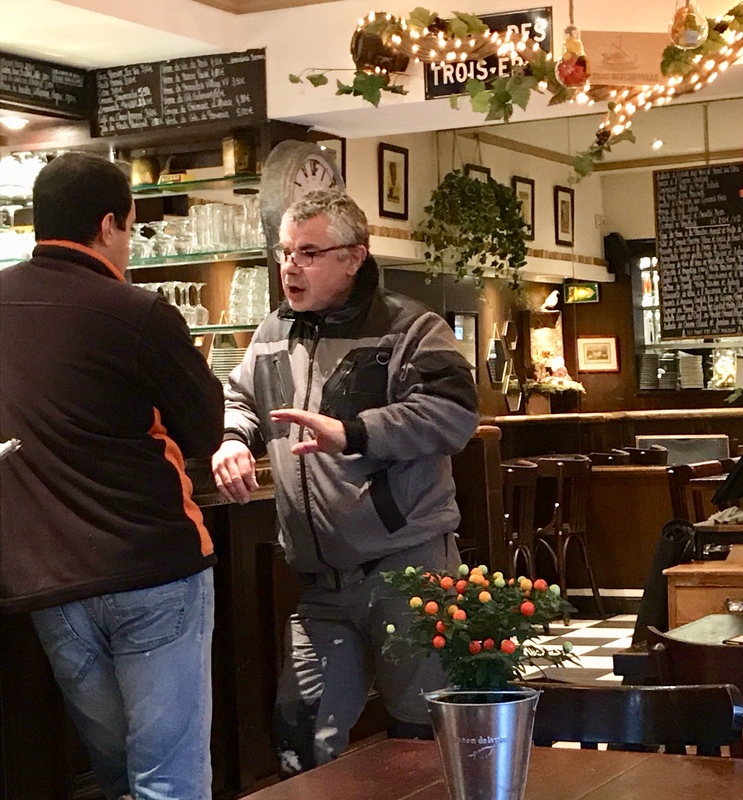 I passed on the $14 breakfast, and instead went around the corner to the charming Au Bouquet St. Paul bar and bistro for a $11 cheese omelette served with a salad, baguette, coffee and pitcher of hot milk. *With darkness falling by late afternoon, there’s no need to wait until 7 p.m. for dinner (the time most Parisian restaurants reopen in the evening) unless you have a specific restaurant in mind. Plenty of cafes, such as Au Bouquet St. Paul, advertise “Service Continu,” meaning they serve food all day. Ethnic restaurants - African, Thai, Vietnamese etc. - tend to open on Sundays when others are closed. 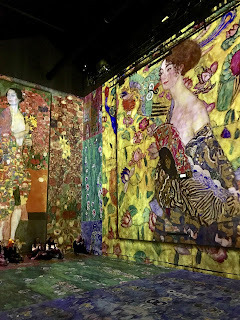 *There's always something going on art-wise in Paris. Stop at a newsstand for a copy of l'officiel des spectacles, a weekly entertainment guide, or visit its website, for listings of special exhibits, concerts etc., many of them free. Extended until January 6 at L'Atelier des Lumieres, Paris's first digital art museum, is a stunning light and music extravaganza featuring the works of Viennese artists Gustav Klimt and Hundertwasser. The paintings are transformed as images onto 30-foot- high walls and ceilings inside a restored foundry. Visitors wander wherever and forever long as they want, listening to classical music that's paired with the changing images. A month ago, this exhibit would have required pre-booked tickets for a particular day and time. The Friday after Thanksgiving, my friend and I walked in off the street and entered with no wait. *Walking tours around Paris continue in the winter. Paris Walks (15 euros) leads walks several times a week in December, January and February including guided, two-hour strolls in the Marais and Montmartre. 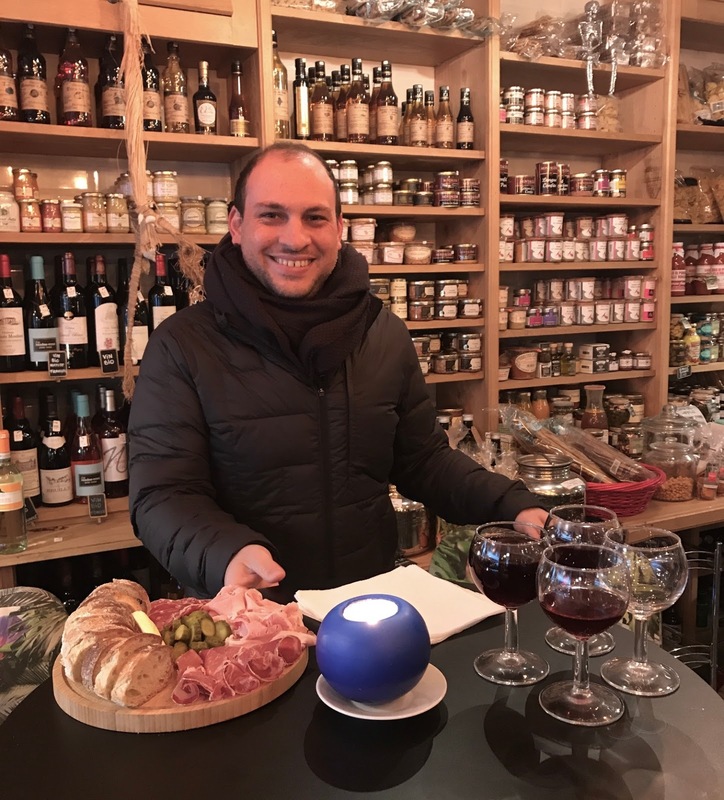 A four-hour “Hip Eats and Backstreets” walking tour (95 euros) with Eatingeurope.com brings visitors backstage with local purveyors in a former working class neighborhood once filled with textile, fur and crystal factories, now populated with high-tech start-ups and young entrepreneurs. Bundled up on a grey day, four of us (compared to 10 or more on busier days) followed our guide, Leo Goldstein who grew up in the neighborhood, first to Fric-Frac ("Breaking the law" in French) on the Canal St. Martin in the 10th arrondissement where the owners experiment with modern riffs on the Croque-Monsieur, a French classic toasted ham and cheese sandwich. We sampled a sweet version made with goat cheese, honey and nuts, then moved onto TSF, a cozy gourmet shop filled with tempting edible gifts such as truffle mustard and pine needle pâté. We sipped a Pinot Noir from the Loire Valley while snacking by candlelight on sausages, pickles and jambon-beurre, crusty bread with lashings of butter and Prince of Paris cured ham. North African immigrants have made couscous one of the most popular ethnic dishes to try in Paris. Few shops go so far as to grind their own Semolina each day. Algerians Nacer and Nora Ouallouche own L'amalgame, a restaurant with just a half-dozen tables in a former butcher shop, where hooks still hang from the ceiling and the works of local artists decorate the walls. Nora's couscous is the consistency of fine sand, a warming winter dish when topped with chick peas, raisins, zucchini, carrots, fava beans and a cigar-shaped North African sausage called merguez. Prices range from around $10-$16, about half what restaurants in more expensive parts of Paris charge. round as he used a ping-pong table to cut our treats into small pieces. Eating standing up was not a problem given all of our other stops had been inside cozy places with plenty of time to sit down, relax and chat with the owners. I couldn't think of a better way to spend a winter afternoon in Paris. Next: My dinner with Thomas arranged through the eatwith.com meal-sharing site that's become the Airbnb of dining. Agree with your take on Paris in the winter! Just pack the long-johns, gloves and ear muffs!